^ Blanco, R. E.; Jones, W. W. (2005). “Terror birds on the run: a mechanical model to estimate its maximum running speed”. Proceedings of the Royal Society B 272 (1574): 1769–1773. doi:10.1098/rspb.2005.3133. PMC 1559870. PMID 16096087. http://rspb.royalsocietypublishing.org/content/272/1574/1769.full.pdf. ^ a b Woodburne, M. O. (2010-07-14). “The Great American Biotic Interchange: Dispersals, Tectonics, Climate, Sea Level and Holding Pens”. Journal of Mammalian Evolution 17 (4): 245–264. doi:10.1007/s10914-010-9144-8. PMC 2987556. PMID 21125025. https://www.ncbi.nlm.nih.gov/pmc/articles/PMC2987556/. ^ a b c Angst, D.; Buffetaut, E.; Lécuyer, C.; Amiot, R. (2013). 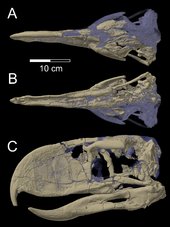 “"Terror Birds" (Phorusrhacidae) from the Eocene of Europe Imply Trans-Tethys Dispersal”. PLOS One 8 (11): e80357. doi:10.1371/journal.pone.0080357. PMC 3842325. PMID 24312212. https://www.ncbi.nlm.nih.gov/pmc/articles/PMC3842325/. ^ Tambussi, CP; de Mendoza, R; Degrange, FJ; Picasso, MB. (2013). “Flexibility along the Neck of the Neogene Terror Bird Andalgalornis steulleti (Aves Phorusrhacidae)”. PLOS One 7 (5): e37701. doi:10.1371/journal.pone.0037701. PMC 3360764. PMID 22662194. https://www.ncbi.nlm.nih.gov/pmc/articles/PMC3360764/. ^ Bertelli, Sara; Chiappe, Luis M; Tambussi, Claudia (2007). “A New Phorusrhacid (Aves: Cariamae) from the Middle Miocene of Patagonia, Argentina”. Journal of Vertebrate Paleontology 27 (2): 409–419. doi:10.1671/0272-4634(2007)27[409:ANPACF]2.0.CO;2. ^ Webb, S. David (23 August 2006). “The Great American Biotic Interchange: Patterns and Processes”. Annals of the Missouri Botanical Garden 93 (2): 245–257. doi:10.3417/0026-6493(2006)93[245:TGABIP]2.0.CO;2. ^ Alexander Suh (2011-08-23). “Mesozoic retroposons reveal parrots as the closest living relatives of passerine birds”. Nature Communications 2 (8): 443. doi:10.1038/ncomms1448. PMC 3265382. PMID 21863010. http://www.nature.com/ncomms/journal/v2/n8/full/ncomms1448.html. ^ Jarvis, E. D.; Mirarab, S.; Aberer, A. J.; Li, B.; Houde, P.; Li, C.; Ho, S. Y. W.; Faircloth, B. C. et al. (2014). “Whole-genome analyses resolve early branches in the tree of life of modern birds”. Science 346 (6215): 1320–1331. doi:10.1126/science.1253451. PMC 4405904. PMID 25504713. https://pgl.soe.ucsc.edu/jarvis14.pdf.